There is often said to be a trade-off between growth and decarbonisation, but the evidence shows that advanced economies can combine large emissions cuts with continuing economic growth. Policy on greenhouse gas emissions reductions is often framed as a trade-off between greater emissions reductions and greater economic growth. However, while emissions clearly can’t be reduced to zero immediately, faster emissions reductions can be accompanied by robust economic performance. The clearest example of this is the UK. 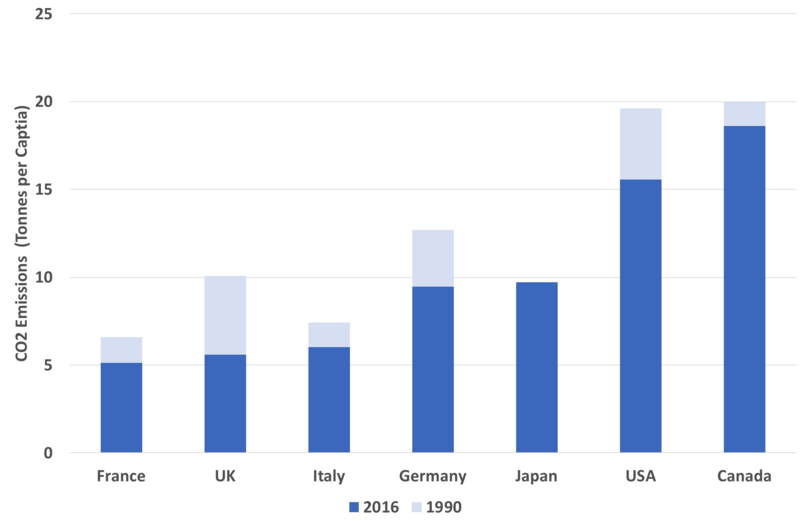 Since 1990 the UK has cut its total greenhouse gas emissions much more rapidly than other G7 countries, while growing its economic output per capita more than the average. This is illustrated in Chart 1. 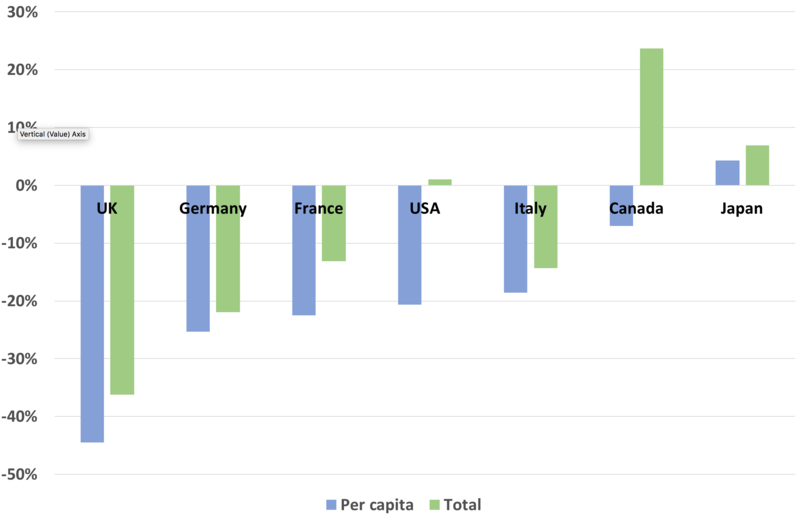 The extent by which the UK has cut its per capita emissions relative to other countries is emphasised in the following charts, which show that the UK has achieved by far the largest reductions in per capita CO2 emissions. Note: Data in these charts is for CO2 only, excluding other greenhouse gases. Of course, some of the relative changes reflect circumstances. The UK started with relatively high emissions, including extensive use of coal in power generation. In contrast, France already had a low carbon power sector in 1990, and in 2016 France’s per capita emissions remained about 8% below those of the UK, even though UK emissions had fallen much more from their 1990 levels. Germany has also achieved significant reductions, having benefitted from reductions in emissions in the former East Germany and installing large amounts of renewables. However it has been hampered by continuing extensive use of coal and lignite for power generation. The USA has accommodated significant population growth with only a small rise in emissions, but this is clearly nowhere near enough if it is to make an appropriate contribution to global reductions. Emissions remain at almost three times UK levels. Canadian emissions are also high and have increased in absolute terms. 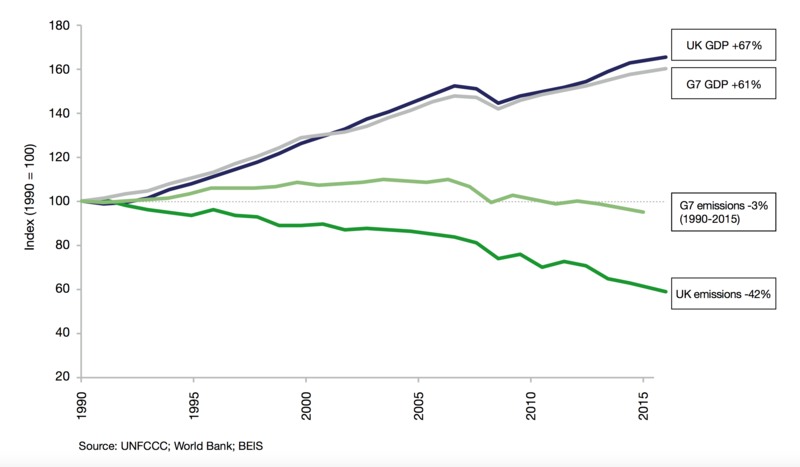 Japan’s emissions have grown slightly over the period. Some falls in emissions in G7 economies may reflect a shift in the global pattern of emissions, with reduced emissions from industry in the G7 economies balanced by increases in China and elsewhere. However this can’t account for all of the reductions that have been achieved, or the vast differences in reductions between countries. Policy has certainly also played its part. 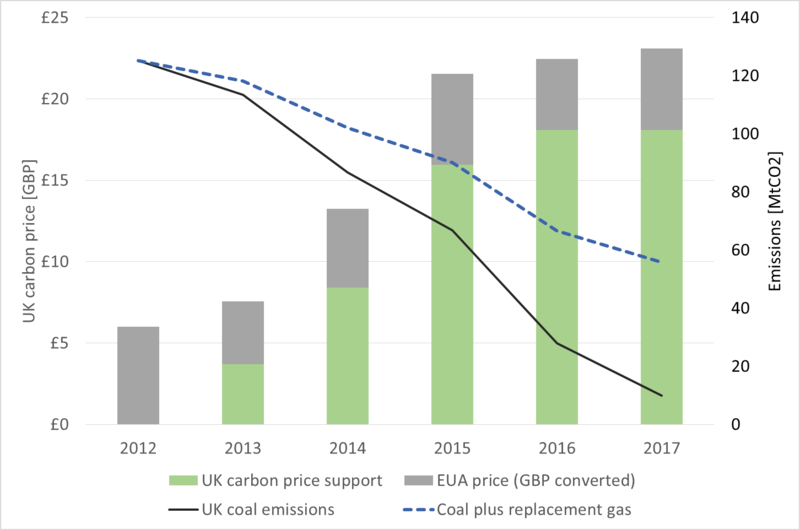 UK policy has successfully targeted relatively low cost emissions reduction, notably reducing coal use in the power sector. Above all the Climate Change Act (2008) has provided a consistent and rigorous policy framework. And whatever the reason, one thing is clear. Cutting emissions more can accompany growing the economy more. This entry was posted in carbon budget, climate change, Climate change policy, emissions targets, greenhouse gas emissions, international comparisons, long term targets, power generation and tagged climate change, climate change policy, decarbonisation, emissions trading, power generation, renewables on 08/03/2018 by adamwhitmore. Recently agreed reforms to the EUETS mean that excess allowances in the MSR will be cancelled. This further strengthens the case for actions such as phase-out of coal plant, increasing energy efficiency and deploying more renewables. About a year ago I looked at whether additional actions to reduce emissions in sectors covered by the EUETS do in practice lead to net emissions reductions over time [i]. It is sometimes claimed that total emissions are always equal to the fixed cap. By implication additional actions do not reduce total emissions, because if emissions are reduced in one place there will be a corresponding increase elsewhere. This is sometimes called the “waterbed hypothesis” by analogy – if you squeeze in one place there is an equal size bulge elsewhere. Although often repeated, this claim is untrue. Under the EU ETS at present the vast majority of emissions reductions from additional actions will be permanently retained, reflecting the continuing surplus of allowances and the operation of the MSR. Furthermore, over the long term the cap is not fixed, but can respond to circumstances. For example, tighter caps can be set by policy makers once emissions reductions have been demonstrated as feasible. When I last looked at this issue, the fate of additional allowances in the MSR remained necessarily speculative. It was clear that additional excess allowances would at least not return to the market for decades. It also seemed likely that they would be cancelled. However, no cancellation mechanism was then defined. This has now changed with the trilogue conclusions reached last week, which include a limit on the size of the MSR from 2023. 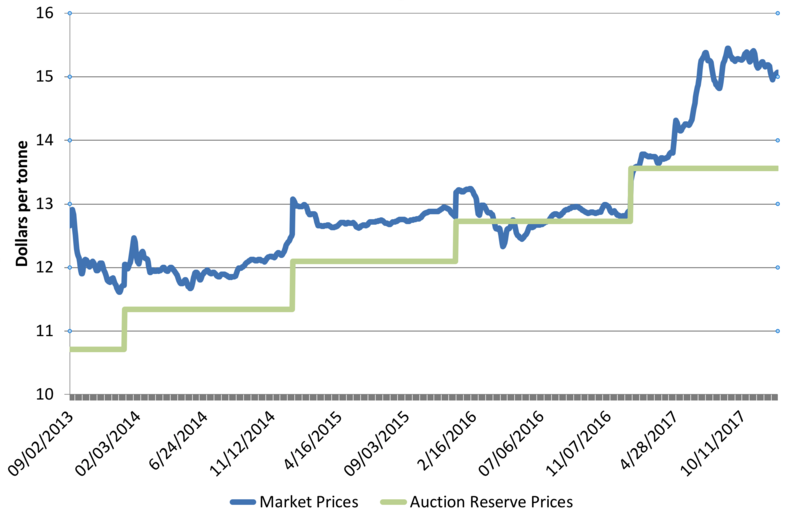 The limit is equal to the previous year’s auction volume, and is likely, given the size of the current surplus, to lead to large numbers of allowances being cancelled in the 2020s. With this limit in place there is a very clear pathway by which allowances freed up by additional actions, such as reduced coal burn or increased renewables, will add to the surplus, be transferred to the MSR then cancelled (see diagram). Total emissions under the EUETS will be correspondingly lower. 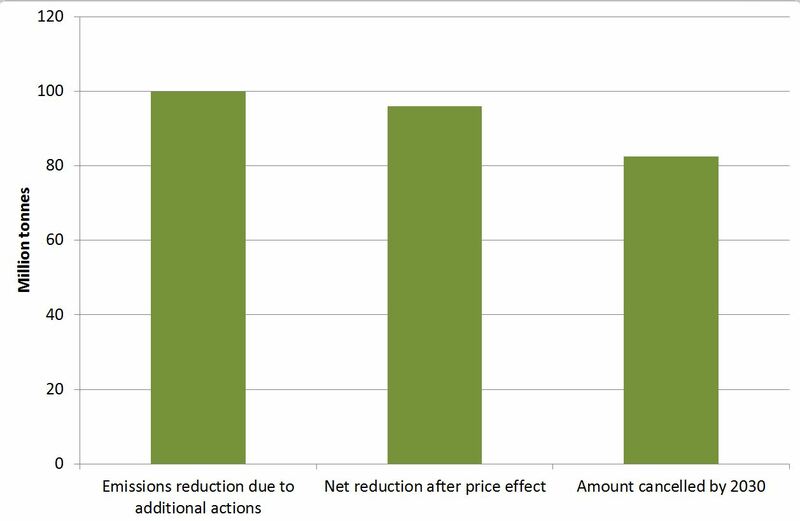 Modelling confirms that with the limit on the size of the MSR in place a large majority of reductions from non-ETS actions are retained, because additional allowances freed up almost all go into the MSR, and are then cancelled. This is shown in the chart below for an illustrative case of additional actions which reduce emissions by 100 million tonnes in 2020. Not all of the allowances freed up by additional actions are cancelled. First there is a small rebound in emissions due to price changes (see references for more on this effect). Then, even over a decade, the MSR does not remove them all from circulation. This is because it takes a percentage of the remainder each year, so the remainder successively decreases, but does not reach zero. 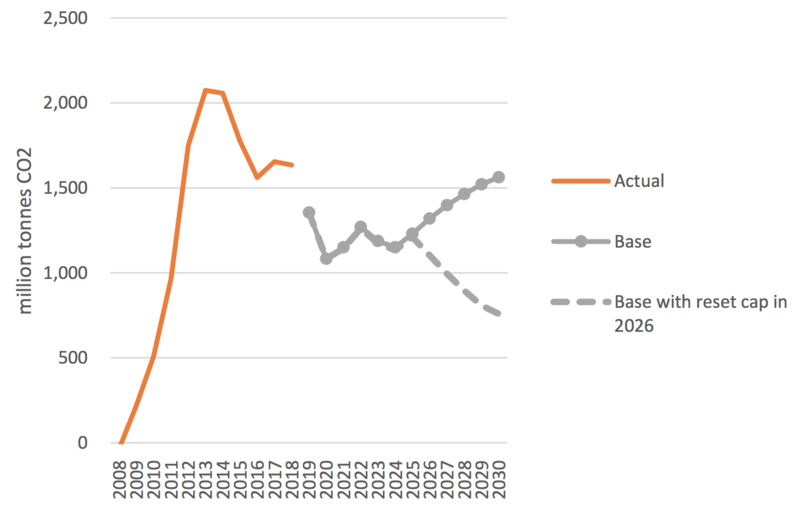 If the period were extended beyond 2030 a larger proportion would be cancelled, assuming a continuing surplus. 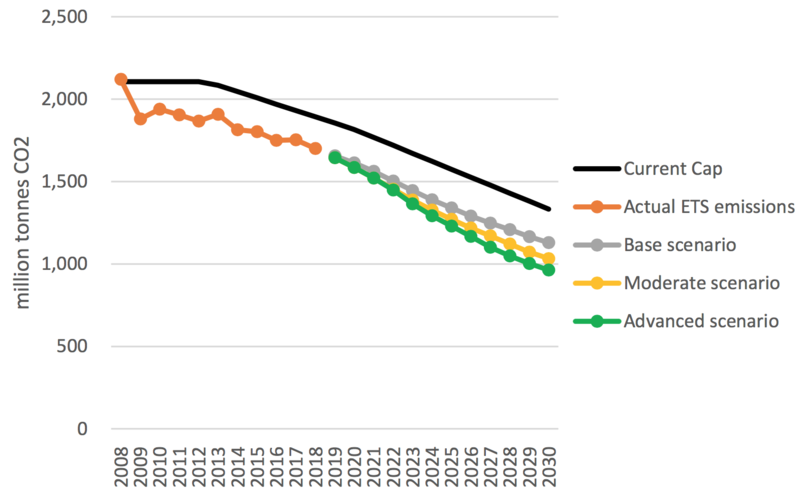 Nevertheless over 80% of allowances freed up by additional actions are cancelled by 2030. The benefit of additional actions is thus strongly confirmed. When the market eventually returns to scarcity the effect of additional actions becomes more complex. However additional actions are still likely to reduce future emissions, for example by enabling lower caps in future. Policy makers should pursue ambitious programmes of additional action in sectors covered by the EUETS, confident of their effectiveness in the light of these conclusions. Some of the largest and lowest cost gains are likely to be from the phase out of coal and lignite for electricity generation, which still accounts for almost 40% of emissions under the EUETS. Continuing efforts to deploy renewables and increase energy efficiency are also likely to be highly beneficial. [i] See https://onclimatechangepolicydotorg.wordpress.com/2016/10/21/additional-actions-in-euets-sectors-can-reduce-cumulative-emissions/ For further detail see https://sandbag.org.uk/project/puncturing-the-waterbed-myth/ . A study by the Danish Council on Climate Change reached similar conclusions, extending the analysis to the particular case of renewables policy. See Subsidies to renewable energy and the european emissions trading system: is there really a waterbed effect? By Frederik Silbye, Danish Council on Climate Change Peter Birch Sørensen, Department of Economics, University of Copenhagen and Danish Council on Climate Change, March 2017. This entry was posted in carbon pricing, climate change, Climate change policy, emissions targets, emissions trading, energy efficiency, greenhouse gas emissions, long term targets, power generation, renewables and tagged carbon pricing, climate change, climate change policy, decarbonisation, emissions trading, emissions trading scheme, energy efficiency, power generation, renewables on 15/11/2017 by adamwhitmore. The UK should change the way it accounts for emissions under its legally binding carbon budgets, whether or not it remains part of the EUETS. An apparently technical question about the UK’s accounting for its carbon budgets raises broader questions about alignment of targets and policy instruments. The UK’s carbon budgets are legally binding obligations under the Climate Change Act (2008) to limit total emissions from the UK. Checking whether emissions are within the budget ought to be simple. Measure the UK’s emissions to see if they are at or under budget. If not there’s a problem. While this may sound bizarre, there was a logic to it when the rules were established. If UK emissions from the traded sector are above the UK’s allocation UK emitters need to buy in EUAs. If the scheme were short of allowances, as was expected when present accounting rules were set, the additional EUAs bought by UK emitters to cover emissions above the UK’s allocation would lead to reduced supply of EUAs for others. There would in consequently be reduced emissions elsewhere matching the increased emissions in the UK. The approach was therefore to some extent a reliable measure of net emissions. It also aligned with the EUETS having clear National Allocation Plans (NAPs) for EUAs for each Member State, something that no longer exists. Now this type of accounting no longer makes sense. With a large surplus of allowances in the EUETS, if the covered sectors in the UK emit more than their budget they will simply buy surplus allowances. These allowances would otherwise almost all eventually be placed in the Market Stability Reserve (MSR). Under current proposals (and indeed most likely eventualities), these EUAs would eventually be cancelled. Additional emissions in the UK are therefore not balanced by reductions elsewhere – they simply result in buying surplus EUAs which would never be used. This type of situation is sometimes called “buying hot air”. To avoid this occurring in future, accounting for carbon budgets needs to change to actual emissions. This will necessarily happen anyway if the UK leaves the EU ETS. UK allocations under the EUETS will no longer exist. Accounting cannot be based on a non-existent allocation. But even if the UK stays part of the EU ETS the basis of accounting should change to prevent the UK is meeting its carbon budgets by simply buying in surplus EUAs. The possibility of buying in surplus to cover UK emissions appears quite real. UK emissions were above allocation until quite recently. This was not too serious a problem then, because carbon budgets were being met fairly comfortably anyway. However the situation may recur under the 2020s and early 2030s under fourth and fifth carbon budgets, which will be much more challenging to meet. Total UK emissions could be allowed to rise above those carbon budgets simply as a result of an accounting treatment. When a target applies to a jurisdiction that does not wholly align with the policy instrument there will always be a need to consider circumstances in assessing whether targets are being met. The UK should not be able to meet its carbon budgets simply due to an accounting convention. Current rules were put in place before the current oversupply under the EUETS arose. It is no longer fit for purpose. It should be changed to accounting based on actual emissions whether or not the UK is part of the EUETS. This consists of auctioning plus free allowances plus UK allocation under the NER. In Phase 4 it would also include any allocation from the Innovation Fund. Future volumes placed in the MSR and thus excluded from auctioning would also be deducted from the total. 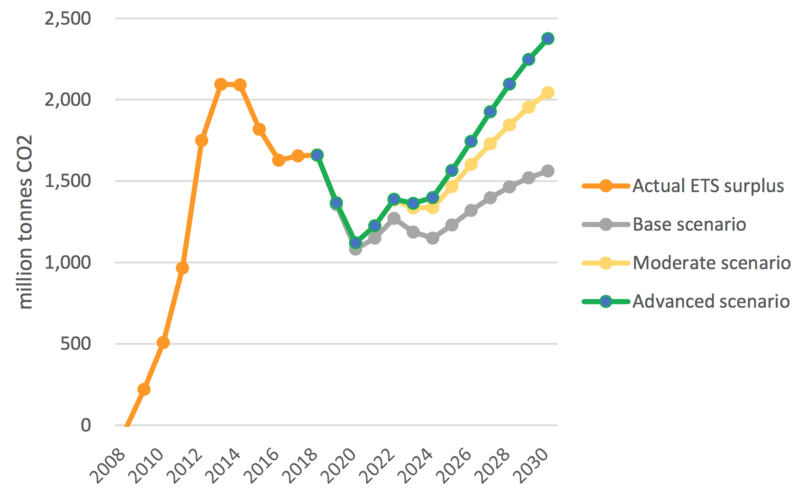 If the UK were to leave the EU ETS and backloaded UK allowances currently destined for the MSR were to return to the market this would have a significant effect on measured performance against carbon budgets under current accounting. Whether this led to total actual emissions being above carbon budgets would depend on the performance of the non-traded sector. This entry was posted in carbon pricing, climate change, Climate change policy, emissions trading, power generation and tagged carbon pricing, climate change, climate change policy, emissions trading, emissions trading scheme, EUETS, power generation on 20/06/2017 by adamwhitmore.